I discovered hand weaving in 1978 during a short stay at Penn State University. I loved the thrill of taking yarns of all kinds and seeing the woven cloth take shape. I was very happy weaving and eventually sold woven items at a gift shop in North Carolina and was able to buy my very own 8 harness loom. Nothing could stop me now! Many of my friends were hand spinners and would insist I should spin, too. Eventually I relented and took a spinning course. A whole new world opened up for me. Now I was able to take a raw fleece and turn it into wonderful cloth. 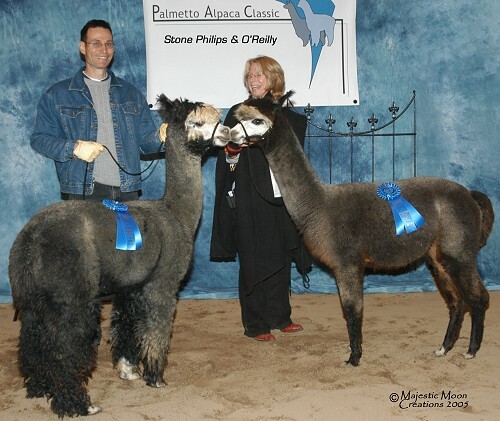 Larry and I bought our first alpacas in 1991 while living in Ohio. 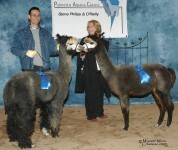 We bought a weanling female and male alpaca and a few months later bought a bred female. With in a year we had our first cria, a female. This female cria was later purchased by a then unknown alpaca farm called Magical Farms. Although I was saddened by her sale, she went to a good home and our alpaca business was off and running.It may be hard for some to understand the rewarding feeling of raising your own animals, shearing them, washing and carding their wool, spinning the wool into yarn and then weaving the yarn into something as simple as a scarf. Over time I accumulative a lot of “stuff” such as looms, yarns, fleeces, spinning wheels, and related spinning and weaving supplies. I stuffed it under beds, tucked it into closets, it filled the basement, baskets overflowed throughout the house—something needed to be done. A store. Yep, I needed a storefront so I could sell “stuff”. We moved to Northern Maine in 1999 and have found it to be both a rewarding and challenging place for our alpaca business. We keep alpaca blankets on hand during the winter for those times when the temps drop below zero. The alpacas have done well in our three sided structures year ‘round. They tolerate the winters well and love the cool summers. We usually have a professional shearer up in May to shear the alpacas. It takes several days and we are always looking for “volunteers” to help with the process. We now live in upstate South Carolina after spending 7 years in Maine. 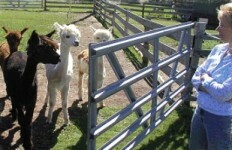 Our 50 alpacas have adapted well to their new climate and hay! I have finally found my store front. I operate North Woods Farm Fiber &Yarn located right here in Inman. So please stop by and visit when you are in the neighborhood. LATEST UPDATE: 2015 SAW MANY CHANGES. WE SOLD THE FARM, MILL, ALPACAS, AND CLOSED THE YARN SHOP. WE CURRENTLY RESIDE IN ST. PETE, FLORIDA AND ALSO SPEND TIME IN NORTHERN MAINE. I AM STILL WORKING WITH FIBER AND SPEND TIME DYEING YARN FOR SHOWS AND PALMETTO YARN SHOPPE(Campobello, SC). I am a partner along with two other great friends in the Palmetto Yarn Shoppe. UPDATE 2017: Sadly our friend Nathan Huettig died of cancer in January. Nathan and Melanie had purchased our farm, mill and alpacas in 2015. They loved the lifestyle. Melanie and her 5 children took care of the alpacas and ran the mill. Melanie has now sold the alpacas and the mill. Please keep Melanie and her family in your prayers. As for me, I am still dyeing and have relocated to more space in Clearwater, FL. I can on occasion be found at FAB FIBER, in Gulfport, FL. 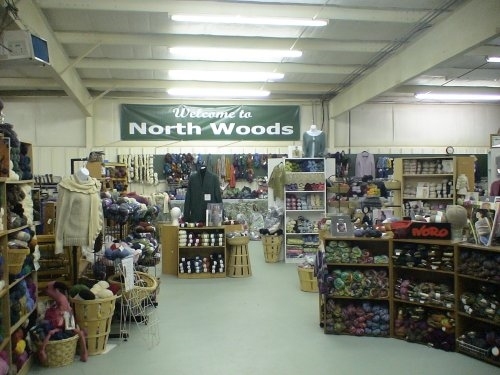 My hand dyed yarns are available in this fun shop. Please stop by when in the area and say HI! to Margot, Elizabeth, Vida, Debbie, and Stella Vaughn. Great ladies!